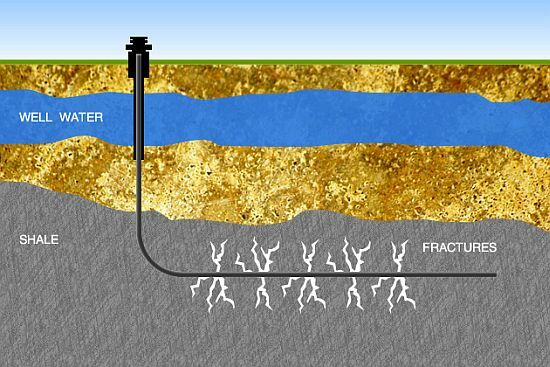 The common myth is that fracking is a new technology. While recent advances in technology have improved fracking by leaps and bounds, fracking itself can be traced back to the Civil War. In 1862, Col. Edward A.L. Roberts was on the battlefield in Fredericksburg, Virginia when he witnessed the effects of Confederate soldiers firing explosive artillery shells into a narrow canal that was an obstruction on the battlefield. This sparked an idea in Roberts’ mind of how explosives could be used as a method to increase oil production in wells with what he described as superincumbent fluid tamping. In 1866, Col. Roberts was issued U.S. Patent No. 59,936 for what was described as the Roberts exploding torpedo. The torpedo was basically an iron casing containing 15 to 20 pounds of gunpowder. In 1866, Roberts conducted a series of experiments where his newly patented torpedoes were lowered in wells. Then the boreholes were filled with water, hence the superincumbent fluid tamping, to concentrate the concussion of the explosion and increase the “fracturing” of the formation. The torpedoes were then detonated via a wire running from the shell to the surface. Roberts’ experiments were wildly successful. Oil production in some of the wells increased by 1,200% within a week of the shell detonation or “exploding shot”. This gave birth to the Roberts Petroleum Torpedo Company. Roberts’ company charged from $100 to $200 for each torpedo detonation. In addition to the charge per torpedo, the company also received a royalty of 1/15 of the profits generated by the procedure. The exploding shot method was used for decades in oil production. As you can see, fracking is not some newfangled technology, but has been improved upon to what it is today. These advances have led to the shale revolution which has been a saving grace for the American economy.